The Ministry of the Interior in Gaza is deploying security forces on the border with Israel and intensifying its presence in the area in order to prevent Palestinian Arabs from crossing into Israel from Gaza without documents, the Ma’an news agency reported on Wednesday. The announcement came hours after a gunfight erupted on the border with Israeli soldiers, leaving one soldier critically wounded. Ministry spokesman Iyad al-Buzm did not directly mention the incident, noted Ma’an, instead stressing that the deployment was about preventing Gazans from crossing into Israel. “There are a few cases where young people try to sneak into the ’48 lands (Israel -ed. ), but Palestinian security forces have arrested some this year and Israeli forces arrested those who successfully entered,” al-Buzm said. “We are looking carefully at the issue in order to stop the Israeli side from recruiting collaborators,” he added, according to Ma’an. Al-Buzm said that Gaza security forces had been working on the issue for the last two months. Al-Buzm called on the unity government to fully carry out its duties in Gaza, adding that the security situation in Gaza is stable despite the difficult circumstances, including a lack of salaries and contact with the unity government’s ministry of the interior. Wednesday’s incident came after Gaza terrorists fired a rocket at Israel last Friday in a breach of the truce with Israel, in at least the third such rocket attack since the ceasefire that ended Operation Protective Edge in August. 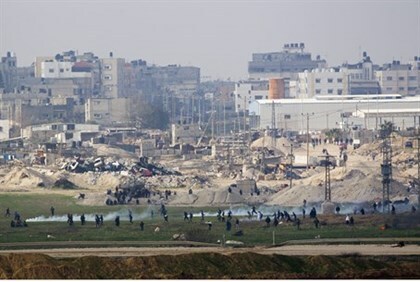 In response to the rocket attack, the IAF struck Gaza concrete factories used to rebuild the terror tunnels leading into Israel and built to attack Israeli civilians. Over 30 such tunnels were destroyed in the operation, but since it ended Hamas has been busily rebuilding them. After Wednesday’s incident, Defense Minister Moshe Ya’alon said that Israel is not interested in an escalation in Gaza but will respond to any acts of aggression from terrorists in the region. “We are not interested in an escalation or harming the rehabilitation operations in Gaza, but Hamas must not test our patience in the face of attempts to disrupt our lives,” Ya’alon said. “We consider Hamas responsible for what is happening in Gaza. We will not allow a routine of firing and we will also respond with determination and strength in any similar case,” he added. Hamas has denied that the sniper who carried out Wednesday morning’s attack against IDF soldiers was one of its members.